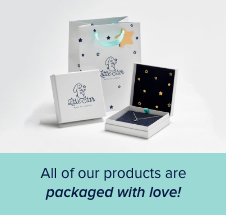 We go to great lengths to bring you the best product we think possible and we want your piece of Little Star Jewellery to be cherished for a lifetime, we therefore suggest the following in order to aid preserving your jewellery. Silver Jewellery will naturally tarnish over time so we have added rhodium plating to all of the pieces to maintain to the perfect shine longer, but please always protect your jewellery. Although a few scratches are to be expected over time please try to avoid chemicals, prolonged sunlight and extreme heat or cold to minimise these effects. Using a soft cloth is an effective way to keep Silver, Gold and Rose Gold Plated jewellery looking shiny and lustrous. A silver cleaner can also be used to clean sterling silver pieces if tarnished. Do not use paper towels to clean metal as they can cause scratching. To protect your jewellery pieces should be individually placed in a pouch or within a soft lined box to stop them being scratched or tangled, the Little Star Box is perfect. Ideally store your jewellery in a dark, cool and dry place, try to keep pieces apart so that they don’t rub together or tangle up. Gold plating is a layer of 9ct gold over sterling silver. Avoid wearing your gold plated jewellery in the shower or when swimming. Chlorine, especially at high temperatures can damage or discolour your gold plated jewellery. Gold Plating will naturally fade over time. As an organic material pearls are much softer than most other gemstones and can be easily scratched, so take care when cleaning. Wipe your freshwater pearls with a soft cloth after wearing and occasionally wipe clean with mild soapy water. Allow the pearls to dry before putting them away. Please avoid chemical cleaners especially those containing ammonia and bleach, as this will destroy their lustre. Do not clean your pearls in an ultrasonic cleaner, the vibrations can shatter them. The word is from the ancient Greek ἀδάμας – adámas “unbreakable” and as a mineral composed of pure carbon diamonds are the hardest naturally occurring substance known. However they can still suffer chips and fractures occasionally if knocked with force, we therefore recommend treating your jewellery with care. We advise cleaning your precious stones with a clean, soft, damp cloth after wearing and occasionally wipe clean with mild soapy water.